This is NOT a “hit job” on McDonald’s. Okay, it is a hit job on McDonald’s. However, in my defense, McDonald’s drew first blood. To fully understand this column, you must have seen that commercial where the young McDonald’s employee shows up at McDonald’s and tells his manger that he has received his college acceptance letter. Until this point, everything is normal. It’s a McDonald’s. All hell is breaking loose. People are at the counter, a vehicle is waiting at the drive thru window. An employee with a headset is manning the drive thru window. Cooks are flipping burger patties. It’s a busy McDonald’s operating at a minimum of DEFCON 3. When I walk down the street, people probably eye my “robust” physique and think to themselves, ‘I bet that guy know his way around a McDonald’s menu.’ Those people would be correct. But I doubt that I am the only soul, among my loyal readers, who enjoys “dining” at McDonald’s. I’m not saying I’m an expert, but I’ve got a lot of McDonald’s experience under my belt (sadly). Can you, even for a moment, even for a micro-nanosecond, imagine a McDonald’s manager calling his employees off their stations, as they busily keep the bags of McNuggets streaming over the counter and through the drive thru window, having them form a circle, and then reading a letter to the assembled crowd? Let’s picture how this scenario would play out in the real world. The line at the counter stacks up as those toward the front wonder where everyone disappeared. The drive thru line comes to a sudden halt, and cars start piling up filling the drive thru lane. The guy in his car by the ordering speaker starts yelling for someone’s attention. The cars begin backing up into the parking lot blocking traffic. The burgers which are STILL COOKING ON THE GRILL begin overcooking and smoke starts filling the kitchen. It would be PURE, UNADULTERATED, CHAOS. And that, my friends, is why you will only find this McDonald’s in Fantasy Land. Yesterday, I accidentally ate a hamburger the size of a Greyhound Bus. Only it didn’t go down so smooth. This was all Ken Kesey’s fault. Yeah, I know he’s dead, but that doesn’t make it right. I live in Eugene, Oregon, where author and Grateful Dead groupie Ken Kesey is revered. He’s like a white Buddha. 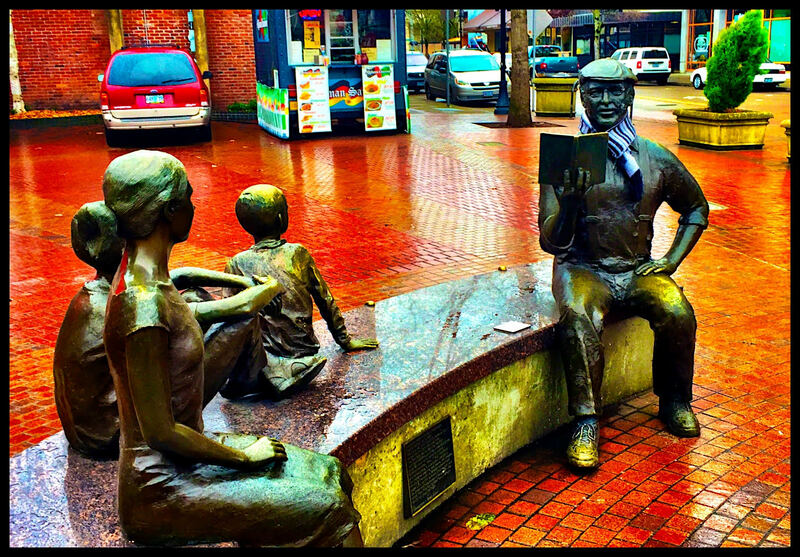 In fact, the city dropped a bronze statue of him reading to kids smack down in the middle of town. The “disenfranchised” use it hang their clothes to dry and/or display their valuable home-crafted trinkets for sale. Drop by to visit it sometime. Go in a group. Take a can of mace. Kesey wrote a book called, Sometimes a Great Notion. It’s supposed to be really good. I haven’t read it, of course, but I saw the movie starring Paul Newman, which was filmed in Oregon. It was really good, and I cried when Paul Newman’s character drowned. Anyway, I’m certain that’s where the tragedy of this hamburger nightmare started. 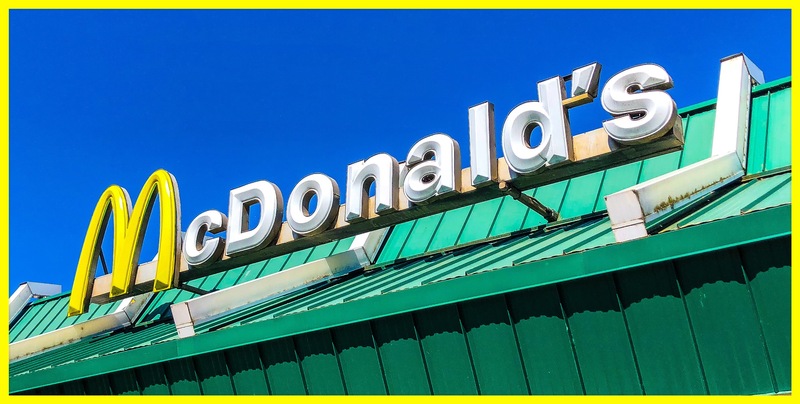 The McDonald’s Worldwide Conglomeration of Death (because there’s something seriously wrong with that outfit), recently came up with their own “Great Notion.” They named it the “Gran Mac.” It’s like the classic Big Mac, only several stories taller, and the diameter of a sewage drain lid. The saying goes that it’s not how many times you fall down that matters, it’s how many times you stand back up. Well, I fell down yesterday. I tripped and fell face first into a Gran Mac. I didn’t want to do it. But this beast was an artery-clogging siren calling me to her rocky shores. Polishing off that monstrosity of a burger (if you can call this aircraft carrier-sized block of carbohydrates and fat a burger) was backbreaking, or I should say, jaw-breaking. My mandibular muscles are still aching. And the carcass of that thing is still rolling around down in my lower intestines. It’s churning away like a muskrat caught in a whitewater river sinkhole. The entire experience is my shame. And before you ask, “no,” I haven’t gotten back up yet.